November the 19th, 18 fished. 18 hardy souls turned up today for this Hall Green Home Guard AC contest, at a frost-bitten Alvechurch Fishery, in rural Worcestershire. This would be the penultimate club match of the season, the climax of the league and the semi final of the knockout – so plenty still to play for. Today we would be fishing Canal Pool, which at just three years old is already proving popular with local anglers. The reason I decided to book this for one of our winter contests is the quality of the silver fish sport on offer; should the carp refuse to play ball, there are plenty of ide, barbel, skimmers and roach to go at. In fact, according to the fisheries.co.uk website, there are 15,000 silver fish in the pool; so, with 18 anglers in attendance, this equates to a very generous 833 silvers per man, and hopefully a few carp thrown in for good measure. Speaking to fishery owner, Mark and fishery manager, Phil before the draw, we were told that the pool had fished very well all week, with 50lb-70lb required to win a contest; carp had dominated the weights and the hoardes of silver fish were conspicuous in their absence. We were also advised that dobbing bread had been a good tactic, as was fishing maggots all over the peg. At 9am we gathered in the car park to draw… well, most of us did. A good number of anglers hung around peg 1 instead, chatting away, gawping into the clear water and generally creating a lot of disturbance around a peg that somebody would draw in five minutes time – a real bugbear of mine. We started proceedings with the knockout draw, where Dave Coyne was pitted against Carl Inman. Then, to a chorus of gasps and ooohs, I found myself up against Tony Newbold, who would be hard to beat at a venue that would suit his careful, precise approach. Next up, we all took a dip into the bag of dreams. Knockout opponent Tony found himself in a decent area, peg 20, along the right-hand bank. I pulled out peg 1, also a reasonable draw, but would the pre-match disruptions have a bearing on how the peg produced? Plan of attack for today’s match was to start off dobbing bread, then I would fish maggots on the slope, hopefully later moving up the far shelf as the water warmed up. I would also plumb up two track lines off at angles at top kit and three sections, this would be a bit of a ‘catch anything’ line in case the silvers decided to have a munch. All of these rigs were attached to Nick Gilbert 4-8 elastic: lovely, soft stuff I’ve put through five top kits in readiness for my winter exploits. Bait for the occasion was standard winter fare: bread, maggots and pellets. At 10.15 the all in was called, I quickly shipped out to 14 meters and dobbed bread against the island rushes. Surprisingly, after spending almost thirty minutes searching every inviting-looking little gap and fishy nook in the far bank vegetation, I didn’t get as much as a dip on my float-tip. Over on peg 20, knockout opponent Tony Newbold had already managed four carp, all caught dobbing bread, on peg 3 Carl had snared two. Because of the pre-match disruption around my peg, I was still reluctant to fish short, so I came back just over a section and laid my rig into the far bank slope. I fed very little on this line, perhaps ten maggots and the same amount of micros. I was getting the odd indication but hooked nothing, it just didn’t feel right, so I upped my feed to 40/50 maggots. This seemed to do the trick, as I soon hooked my first fish of the day, unfortunately though we parted ways as I shipped back. As it was the only area of my swim where I had managed a bite, I persevered with the slope line, and just after the hour mark I caught my first fish of the contest, a common carp of around two pounds. Fifteen minutes or so later I took another small carp from the slope, but it was incredibly slow going; I felt like I needed to catch quicker if I was to compete in the match. 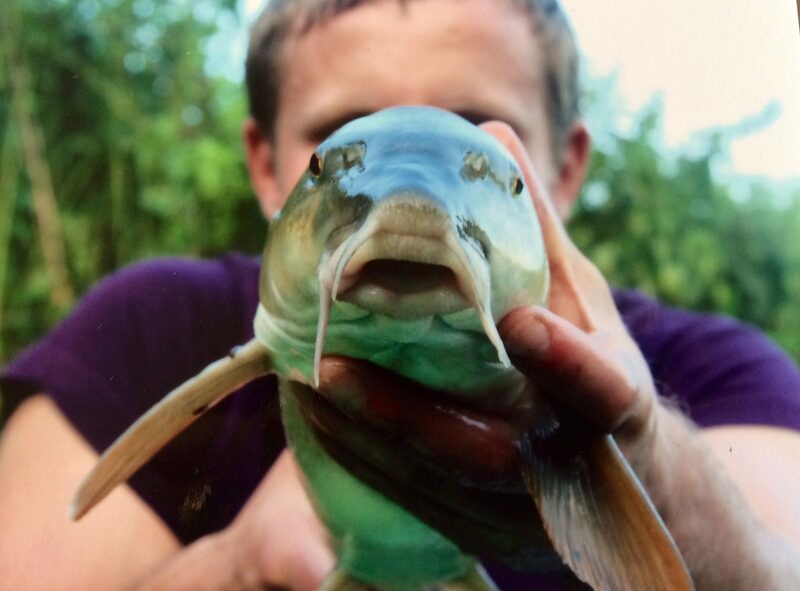 Over on peg 3, Carl had hooked six carp already, only managing to extract three. Because feeding some bait seemed to be working better than a more negative approach, I potted around 150 maggots in on my short pole line, off at an angle to my right; I then went on to my short, left-hand line feeding just a few maggots through a cad pot, but this yielded nothing. A drop onto the pre-baited right hand line though gave me two fish in two casts, along with the knowledge that the fish wanted a bit of bait. This is how I spent the middle hours of my contest, switching between my track lines, feeding through either a big pot or large toss-pot. Occasionally I would venture off to some other area of my peg as I gave the short pole lines a rest, but generally I could keep the odd fish coming if I waited patiently for a bite. Over on peg 3, Carl was beginning to motor, fishing casters and hemp (I’d definitely not considered this bait combo) across to the island. Earlier in the contest he had endured a torrid time, losing fish-after-fish – at one point 7 or 8 consecutively. But he kept his head, went up a hook size and switched his elastic to a lighter grade, then went on a great run, only losing the occasional carp. I wanted to follow suit and fish against the island, but I too was suffering my own problems: the low, glaring winter sun had come right around, shining directly into my face, the white shimmer it left on the water’s surface was excruciating. I could barely see to fish the short pole, never mind venturing out any further. With the final hour of the contest approaching, I felt like I was in a reasonably strong position, although it was unlikely I would catch Carl who was now having a-bite-a-chuck, fishing just off the far bank. Aside from Carl, it appeared that sport was poor for most: knockout opponent Tony had slowed dramatically after his lightning start; Bob, Richard, Ian and Steve were all struggling to my right; on the left hand side of the pool only Nigel appeared to be putting fish in the net with any regularity. Back to today’s events now, and as we entered the final hour of the contest I was grateful for some much-needed cloud cover. Whenever the sun was obscured, I could lay a rig tight into the far bank and actually see it. Also, every time I did this I came back with a fish, sport wasn’t frantic but I definitely felt there were a number of carp in the peg. Unfortunately, Carl’s peg was also getting stronger as the match went on, and I felt I was making little – if any – ground on him. Into the final half hour of the match and fishery manager Phil stood behind me, watching as I fished. As is always the case when the eyes are on me, my angling absolutely went to pot. Not the hooking of fish, as I felt I was presenting my rig nicely and feeding the right amounts, it was my playing and landing of fish that was questionable. My 4-8 Nick Gilbert was definitely far too light, the fish aren’t docile just yet so I had several meters of elastic screaming off all over the peg. Also, my landing was a shambles; Phil watched on in fits of laughter, only pausing to make the suggestion that I am to landing fish what Nicklas Bendtner is to putting the ball in the net. Simply unkind. But true. At 3.15 the whistle blew to draw a close on what was a very enjoyable match. I felt that I had drawn well, there were definitely a few fish in my peg; I also believed that I had fished a decent match in periods. I was left wondering what might have been had the sunlight not hampered me for the majority of the contest. As we packed our kit away, the fishery team made their way around to weigh us in. I was first up, my twenty-odd carp and one ide taking the dial round to 45lb. Next along, Carl’s two nets gave him 52lb, a great return on the day – but it could have been a much bigger weight had he not lost a number of carp early on in the contest. Aside from Nigel Perry’s 32lb, the rest of the weights were all much of a muchness; and watching the weigh in it was clear that the silver fish had completely switched off. Knockout opponent Tony Newbold managed 19lb, a fair return in a tough contest, and good enough to see him finish in 4th place. Also, it was his last contest with us. I’m sure I can speak for the entire club in wishing Nigel and his family all the best in the future – tight lines, mate. Speaking of last matches, we also say a farewell today to Roy Reece, a fine gentleman who will be missed by all in the club. Again, all the best Roy, and tight lines.